Here’s the thing – I’ve followed Luiken from VIOLET EYES all the way to now; it’s been a long road. I think I read VIOLET EYES (and its sequel SILVER EYES) my sophomore year of college? So over a decade ago? Luiken was one of the first authors I ever wrote a fan letter to and I’ve eagerly anticipated further books. 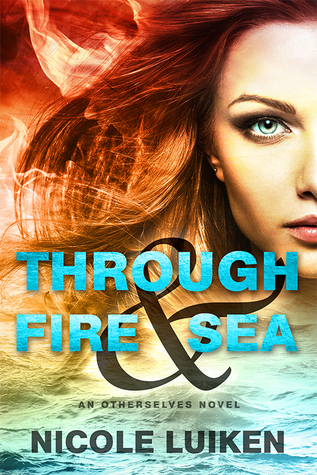 THROUGH FIRE & SEA is the first book in her new series “Otherselves” in which we follow Leah (I presume, based on the ending) as she battles against the evil machinations of Quetrah. I’ll point out her battle against Quetrah is incidental to the fact she’s really trying to escape the guilt and pain of losing someone, which was Quetrah’s fault. I really liked Leah – you saw her growth from a servant girl hoping to please her estranged father Duke Ruben to a powerful young woman using her grief and anger to cut a swath through any who would think to wreck Gideon’s Otherselves’ lives. She made mistakes (plenty of them) and she paid dearly for each one, but that didn’t lessen her belief that she had a purpose. Though it came at a cost, she believed in herself and her abilities. Gideon, oh my poor sweet tormented Gideon. This guy. Comparatively speaking we don’t see him as much as Leah, Holly or Ryan, but honestly he makes his moments count. Like Leah he finds himself torn between a parent who obviously did NOT have his best interests at heart and a new sense of wonder that he could make his own life. His and Leah’s stories parallel each other as much as they intertwine. Holly and Ryan, Leah and Gideon’s Otherselves, are…complicated. How I feel about them is complicated. On the one hand Holly finds herself thrust into a situation she never had control over, fighting to regain control and understand what was happening. Leah is not, at the best of times in these moments, communicative beyond the most basic “I’m right so do what I say”. So I can understand Holly’s hesitation to trust Leah. RYAN HAS NO EXCUSE. Okay that’s not fair he does. He’s lived with the burden of a parent two steps from the mental hospital and a secret so damaging that he hides himself away rather than risk anything. Except…he gets the chance at the life he thought would make his world better and somehow becomes a total d-bag with no consideration for how his actions looked to others at all. His naiveté about Hollywood was, as Holly puts it, exasperating. Not that her jadedness helps matters. Together though, I wanted to smack them both up side their heads and shake them. Even without the gift of being a reader, so I know way more than they know, the amount of suspiciousness should have tipped them off. Quetrah was both a great villain—the build up to her real purpose and her real mission is handled nicely and a bit overplayed. She worked better in the Fire World (where Leah is from) than in the Water World (where Holly was from), though I have to give her props for the fact she never gives up. She’s resourceful, clever, driven and ruthless – giving as good as she got and willing to sacrifice everything for her goals. Really this everything I could have asked for and I look forward to the next book. Especially if Holly and Ryan don’t make an appearance. Because Leah doesn’t need that stress in her life.